We’re nearing the end of the July and that means we’re also wrapping up our salad for dinner theme. You’d think with a whole month dedicated just to salads that things would get boring fast. But, as I’ve said before in Six Steps to an Awesome Dinner Salad, the key is mixing up flavors and ingredients. And as I’ve played around with those notions in the kitchen this month, I’ve realized that at some point I almost forgot that what I’m making and eating actually are salads. Not convinced? Well, I’ve got another salad for you: Thai beef. Guest Chef Yvonne Brunot, of Right Mind Farm and I, worked our way through this simple recipe at one of our farm to workplace cooking demonstrations. If you’re unfamiliar with Thai food and have always thought it sounded a little too adventurous for your cooking abilities, here’s your chance to see how wrong you are. And you probably already have most of the ingredients that constitute this salad as Thai cuisine on hand. Of course, as a salad, this dish highlights produce you can find growing locally right now – lettuce, cilantro, garlic and onions, for instance. Though, as always, change things up to your liking. I threw in peas instead of peppers, as you can see in the picture, and chicken or tofu would be great as well. Stir together fish or soy sauce and brown sugar in a small bowl. Arrange lettuce on individual plates. Heat 2 teaspoons oil in a large nonstick skillet over medium-high heat until hot but not smoking. Stir-fry beef, in batches, until browned on the outside and still pink inside, about 1 minute per batch. Remove from the pan and set aside. Add the remaining 1 teaspoon oil to the pan and cook chili peppers, onions and garlic, stirring occasionally, until softened, about 1 minute. Add the sauce-sugar mixture and bring to a boil, stirring. Remove from the heat and stir in orange and cilantro. Place the beef on top of the lettuce, spoon over the sauce, top with the peanuts and serve. As you set out to form the perfect dinner salad this summer, consider what greens you choose for your base. Though they’re all some shade of green, they’re not all equal, or even comparable, in nutritional value. In fact, the differences between iceberg lettuce and spinach, for instance, are astonishing. But you don’t need to have nutritional data memorized to make wise choices. A simple rule of thumb is to go for the darker and looser varieties. Not to pick on iceberg, or put any iceberg farmers out of business, but iceberg lettuce has some of the fewest vitamins and antioxidants out of all of your salad green options. It’s no coincidence that it also happens to be a very light green color and the leaves form a tight head – the exact opposite of what you should look for. Iceberg’s low nutrient count is due to its high water content, which equates to roughly 96%. Yet, for some reason it still remains one of our country’s most popular lettuces. 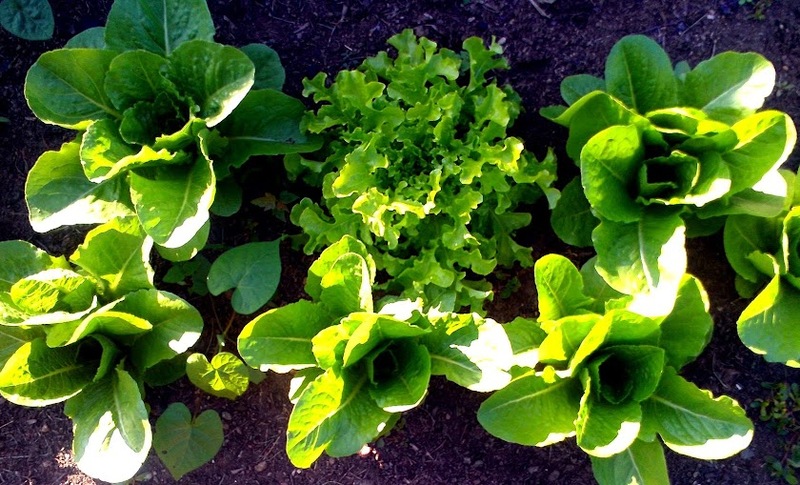 Romaine, on the other hand, with darker leaves and a looser form, has much more to offer. And if you care about taste or texture, I’d say it beats out iceberg in those departments as well. What is it that makes darker greens more worth your while? Vitamin K is at the top of the list – the vitamin that helps your blood clot, protects your bones and can even help prevent certain cancers. Then, there is folic acid (folate), a type of B vitamin that is necessary for healthy cell formation and is especially important for pregnant women. Vitamin A is another prevalent nutrient found in many greens. It helps improve eyesight and strengthens the immune system. If you’re stuck on iceberg, all is not lost. The pale green does contain some nutritional value, just not much when considering the alternatives. Instead, try a mix of greens, whether you’re an iceberg fan or an all around green lover. It will allow you to experience a variety of nutrients, as well as tastes and textures. You can often find bags of mixed greens at the market, or buy a few different ones and experiment. I was pick a variety of greens from my garden when putting together a salad and it never gets boring. On Friday, Everyday Chef gave out samples of two salads at Friday Night Live in downtown Rutland. While they weren’t technically dinner salads – our theme of the month- I thought they were great because they utilized two main ingredients that many people are not familiar with – kale and kohlrabi. Despite the unfamiliarity, both items are grown at Radical Roots Farm right here in Rutland. A visit to their farm stand, which is open on Tuesdays, or any of the stands at the downtown farmers’ market, proves that one doesn’t need to travel far to discover new flavors and healthy, tasteful, items to cook. Or, in the case of these salad recipes, you don’t even need to do any cooking to enjoy. Note: If you want to make these salads into full dinners, you could try a piece of grilled chicken on top of the kale salad and a grilled pork chop on top of the kohlrabi. With the Fourth of July holiday weekend(s) kicking off in just a day, you’re probably dreaming of all the grilled foods you’ll soon be enjoying. And believe it or not, salad can be one of them. Briefly grilling halved Romaine heads adds a nice charred flavor that just tastes like summer. Red onion, soft blue cheese and crispy bacon bring a variety of flavors and textures – a quality you should strive for when assembling any salad. Then, a balsamic reduction drizzled over it all adds an amazing level of tangy sweetness. With a little imagination, you could even stretch this to fulfill your red, white and blue quota. Have a delicious Fourth! Heat 1 tbsp olive oil in a large skillet over high heat. Add the onion and bacon and cook until the bacon is crispy. If not using bacon, go ahead and cook the onions until they start to become translucent. Remove the onion and bacon from the pan and add the balsamic vinegar and 1 tbsp olive oil. Reduce for 2 –3 minutes then remove from heat and set aside. Brush the Romaine with the remaining olive oil. Place on the grill cut side down until grill marks are visible, about 2 minutes. For each serving, place half a Romaine head grilled-side up on a plate and drizzle over the balsamic. Sprinkle with blue cheese, bacon and onions, and garnish with cracked black pepper. I have a very small kitchen and no room to waste on unnecessary appliances and gadgets – not even a toaster. So there are only a select few items that I consider worthy of taking up my precious kitchen space. A salad spinner is one of them. Deemed unnecessary or extravagant by some, if you grow your own greens, or buy them from a farm, it is well worth the investment. I actually enjoy finding dirt, and sometimes even insects, clinging to my greens. It reminds me of where they came from – real soil and real people. Nevertheless, I want my greens clean before eating. The best way to make that happen is to immediately submerge the freshly picked or purchased greens in a bowl of cold water. Then, give them a shake to release any particles to the bottom of the bowl. Cold water is important here because it helps the greens maintain their crispness. 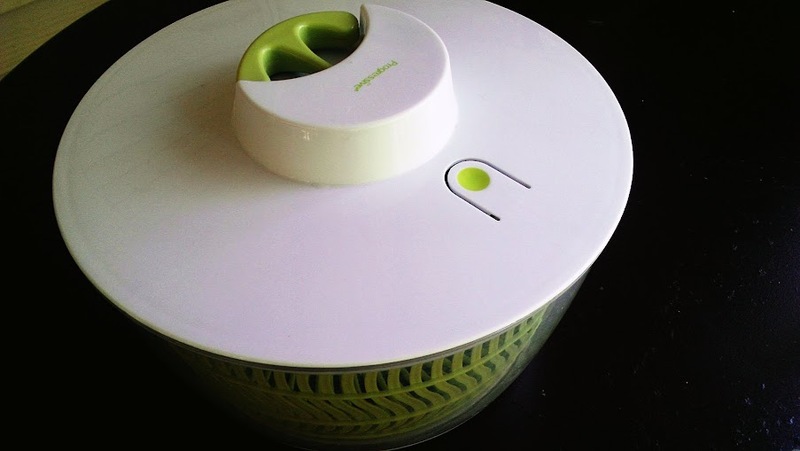 After rinsing is when the salad spinner comes into play. If need be, I tear the greens into smaller pieces. This is certainly required with head lettuces, like Romaine, which are not going to fit into a spinner while intact. Tearing greens by hand is the ideal method, as chopping with a knife can cause bruising. Once the greens are in the spinner, put the lid on and spin. Sometimes this is achieved by turning a crank and other times it requires pulling a string. Either way, I find it kind of fun. Several spins are probably going to be necessary to get the greens sufficiently dry. In some cases, you might find you need to repeat the rinse and spin process a couple of times. What I also like about a spinner is that when I’m done drying my greens, I empty out the water, place a paper towel right inside, and store the whole container in the fridge until using. Of course, a plastic bag with a paper towel inside also works. But if you’re still not sold on a spinner, here’s one additional use: perfectly dressing a salad. Adding the dressing right to the spinner (after drying) makes it easy to get the greens coated and prevents a pool of dressing in the bottom of your salad bowl. Or, you could evenly coat pieces of kale with olive oil when makingKale Chips. The bottom line is that if greens are properly rinsed, dried, and stored, they will remain at their prime for as long as possible – giving you the most for your money. Sure, this could all be completed without a spinner. You could shake the greens dry in between paper towels or clean kitchen cloths, but I find that leads to unnecessary waste or laundry and simply does not do as good of a job. I don’t know about you, but I eat greens all summer long and know that the spinner will be in use throughout the season – much more than that dust accumulating slow cooker. A decent spinner can be found for about fifteen dollars. I actually found one for just a dollar at a yard sale a few weeks ago. By no means should you consider this a luxury item, but rather, the most useful kitchen tool of the summer.